Beware: It is not possible to open a product in another tool. F.e. if you have created a photo book with our online creator tool, you can’t open it with our offline creator tool. 1. Navigate to your ‘documents‘ folder. 2. Open the folder ‘bonusprint’ where you will find different photo book folders. 3. 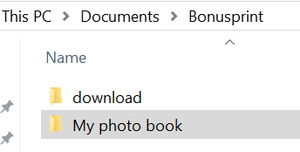 Copy the folder with the title of the photo book you want to transfer to an external drive or USB stick. Please note: it is important that you copy the entire folder. 4. Choose another Windows computer (Windows 7 or higher) with a fast internet connection. 5. Download the offline creator tool from our website on this computer. 6. Copy the album folder from the USB stick or external drive to the computer. Please note: we recommend that you save it on your desktop or in your ‘documents‘ folder, so that you can easily find it. 7. Open the offline creator tool, click on ‘Open’ and navigate to the location of your transferred album folder (desktop or documents). 8. To open the photo book, select the ALB file in the folder and click on ‘open‘. You can now continue creating! 1. Click on ‘Finder > Documents’. 3. Copy this file to an external drive or USB stick. 4. Choose another Mac (Mac OS X version 10.6 or higher) with a fast Internet connection. 5. Download the offline creator tool from our website. 6. Copy the bonusprint photo book file from the USB stick or external drive to the computer. Please note: we recommend that you save the file to your desktop or your documents, so that you can easily find it. 7. Open the offline creator tool, click on ‘File’ in the taskbar and select ‘Open‘. 8. To open the photo book, navigate to the location where you saved the project (desktop or documents), double-click on the file and it will automatically open in the offline creator tool. Photo books that you create in the online creator tool are saved in your account. You can access your account on any computer (Windows or Mac). Simply navigate to your saved projects to open your photo book and continue creating! Projects that you saved in the app on your smartphone or tablet cannot be transferred to another device.